Conowingo, Maryland -- June 8, 2011-- D's Golden Delights, a breeder of golden retriever puppies in Maryland, announces the launch of their new interactive puzzle software available online at no cost. The puzzle is an adorable picture of a previous litter of golden retriever puppies. Parents can download the fun and challenging puzzle game right from their website at http://www.DsGoldenDelights.com/Links.html or on a number of free software sites across the internet. 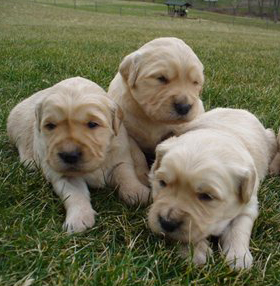 Visitors to the site can also tour the pictures of current puppies available to families in Maryland, Delaware, Pennsylvania, Virginia, New Jersey, and New York. The website also has stories of happy golden retriever owners and their beloved family pets, as well as a picture gallery of previous puppies. For more information, go to www.DsGoldenDelights.com , contact Dianna at 443-250-7871, or email info@DsGoldenDelights.com. In this new video, visitors will learn some of reasons to deal with an experienced breeder of family-raised golden retrievers who offer high value in the industry. For more information, go to http://www.Maryland-Golden-Retriever-Puppies.com to get more information. Questions can be directed to (443) 250-7871 or email: d_sgoldendelights@yahool.com .